You can customize search results in numerous ways on your Mac by telling Spotlight where to search and by telling it, in precise detail, the criteria to use in that search. If the contents you’re searching for reside on the Mac before your very eyes (as opposed to another on your network), make sure that the Search: This Mac button is the one you choose. The button to its immediate right changes depending on what you have highlighted and what you are searching. You see All My Files, also displayed under Favorites in the navigation tree on the left. Choosing either option tells Spotlight to look nowhere else but that folder (and its subfolders). Sometimes, the next button shows any other computer on your network for which you have sharing rights. The Shared option doesn’t appear if no other Mac is on your network with File Sharing turned on. Indeed, you have to set up the computers so that they’re in a sharing mood. Now that Spotlight knows where to set its sights, it’s time to tell it exactly what you’re looking for. Do you want Spotlight to search for an item by its filename? Or do you want it to hunt for nuggets buried somewhere deep inside those files? Remember that in searching for something, you don’t necessarily want to cast too wide a net. The best way to narrow results is to enter as specific a search term as possible right off the bat. As you plan your vacation, typing beach will probably summon the e-mail message Gilligan sent you. But because Spotlight finds all files or programs that match that text, results may also include Microsoft PowerPoint presentations with a beach theme, pictures of your family by the seashore, and songs on your storage drives sung by the Beach Boys. 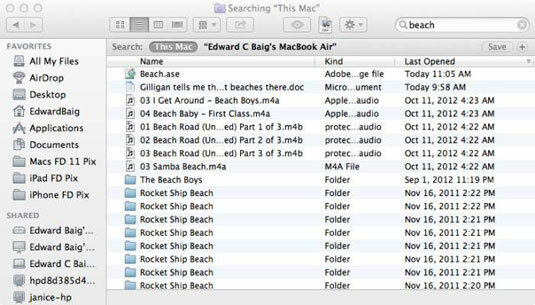 Typing Gilligan and beach together helps you fine-tune your search. And so on. The kind keywords all date back to OS X Tiger, when Spotlight was introduced. Such keywords have since been expanded, so now you can use a label such as author (as in author:baig) or width (as in width:768-1024). Boolean query: You can enter a search phrase using AND, NOT, or OR within parentheses. You can type (Mary Ann OR Ginger) NOT Mrs. Howell to bring up references to either of the first two castaways but not the millionaire’s wife. You can substitute a hyphen (-) for NOT, as in vacation – island, to indicate that you don’t want to see any trip pictures from your tropical adventures. Dates: By entering kind:message created 3/11/12, you can search for an e-mail you sent on March 11 wishing a pal a happy birthday. You can also enter a range of dates, as in kind:images date 3/11/12 – 3/15/12. Quotes and phrases: When you place quotation marks around a particular phrase, Spotlight searches for that exact phrase. If you’re looking for a song with Blue Sky in it, put quotes around the phrase (as in “Blue Sky”) to have Spotlight look for that precise match. Otherwise, Spotlight searches for anything with the words blue and sky in it. Look Up: Dictionary is one of the freebie programs that come on a Mac. Thanks to Spotlight, you can get to the word you want the meaning of in a hurry. Type the word you have in mind in the Spotlight search field, and along with all the other results, Spotlight gives you a Look Up option. Click Look Up, and Spotlight takes you to Dictionary. Calculator: Spotlight can solve a math problem for you without your having to summon the Calculator program. Just type the problem or math equation in the search box, and Spotlight serves up the result. To divide 654 by 7, for example, all you need to do is type 654/7, and Spotlight provides the answer (93.428571429). Web history: Spotlight follows you around the web — sort of. That is, it indexes the names of sites you’ve recently visited. Just enter a search query that relates to a site you want to return to.